It's a pleasure to see you back after all these years and to see you would like to be part again of our honored institution! Dyron has got no akenak yet, so the place is free for the moment. But you were gone for years, so I encourage you to first show you active and implied again in Dyron and Pyr. 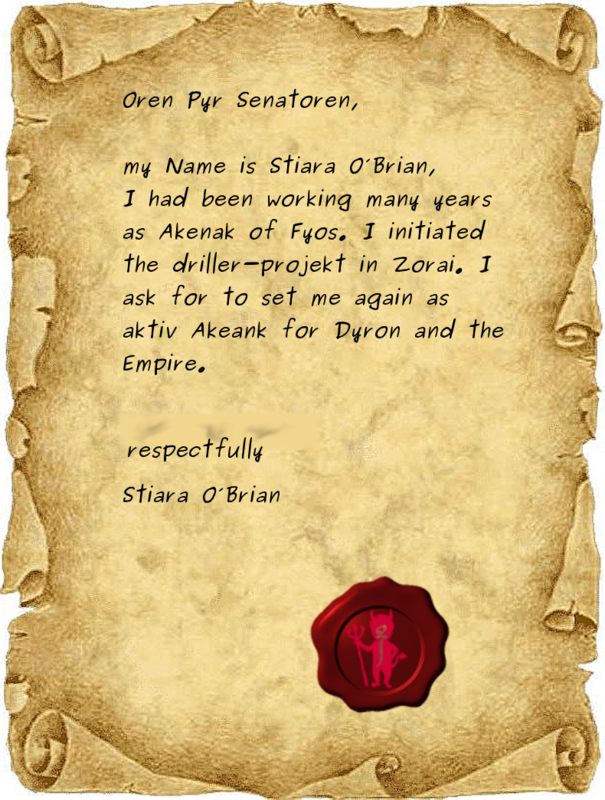 You should also read the Imperial decree about "Civil reorganisation of the Empire cities around their akenak" to know more about the new Civil organisation of the Empire cities and the new way of akenak appointment. Be sure that I (or my successor) will look closely at your actions done as a Patriot of Dyron in the following months, and will wait for your application during an assembly, when you will feel ready. sharükos Lykos will lead the next akenak assembly on 11h - Tria, Frutor 15, 4th AC 2595 (*) and has scheduled some appointments. I've told him I support your application to be akenak of Dyron again and hope you'll be present to this assembly to present yourself.